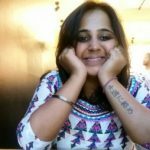 Seeking medical help is the first thing you should do if you are suffering from depression. However, eating the right foods can also help improve your mental health. 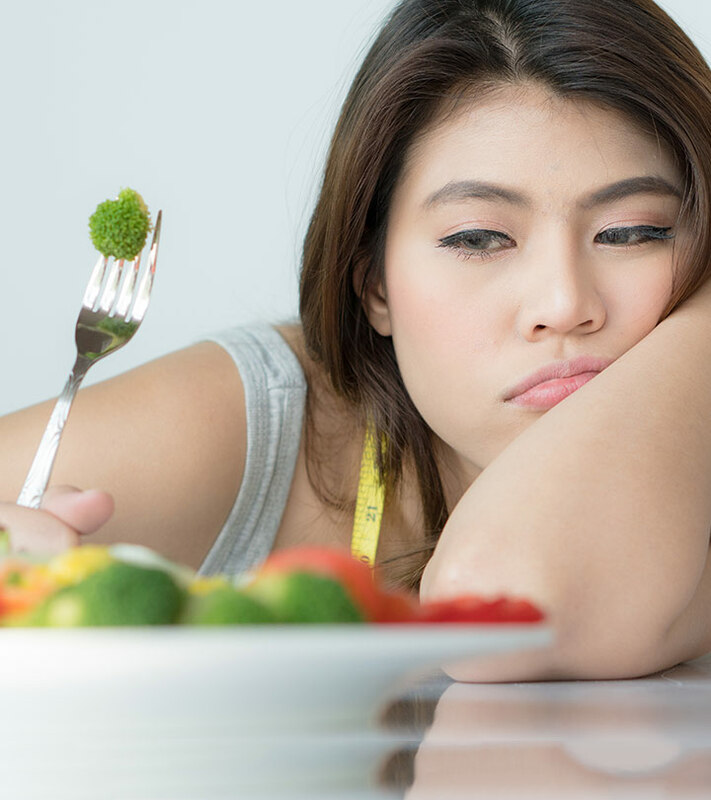 When going through a mental disturbance, most of us tend to make food our last priority. This only contributes to deteriorating mental health. That’s why we are here with a list of foodsyou can include in your diet to help combat depression. It might sound bizarre, but feeding your brain the right kind of fuel can actually help improve your mood. So, scroll down and check them out! Walnuts have several nutrients that can improve mood. They are rich in omega-3 fatty acids, like alpha-linolenic acid, that are critical for your brain’s functioning and physiology. Alpha-linolenic acid is the precursor of eicosapentaenoic acid (EPA) and docosahexaenoic acid (DHA) (1). DHA plays a role in maintaining membrane stability of your cells, the speed of neural signaling, and modulation of serotonin and dopamine (feel-good neurotransmitters) concentrations in your brain. Serotonin and dopamine help control your sleep cycle, depression, and mood swings (1). 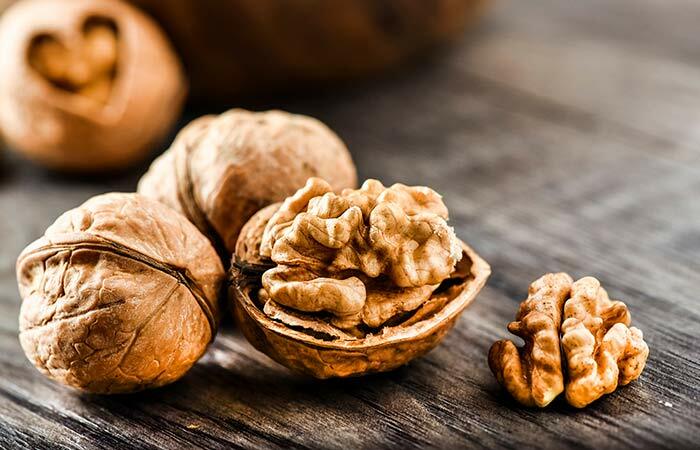 Walnuts are also rich sources of folate, which can help prevent cognitive impairment and depression (1). High glucocorticoids in the blood is a clinical indication and one of the major causes of depression. External supplementation of amino acids like glutamine is shown to curb such depression. 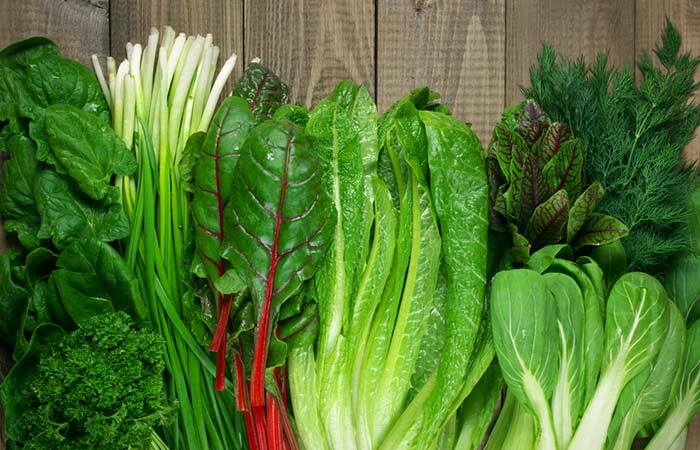 Fortunately, green leafy vegetables are great natural sources of glutamine and glutamic acid (2). Spinach, kale, chard, and lettuce are known to contain not only glutamine, but also folate, vitamin A, vitamin K, magnesium, manganese, and omega-3 fatty acids. The abundant phytonutrients in them act as antioxidant and anti-inflammatory agents, thereby protecting your brain from oxidative stress-induced inflammation and damage (2), (3), (4). Overall, green leafy veggies can boost glutamine levels,and provide some much-needed micronutrients. This is why they have anti-stress and antidepressant effects on your brain (2), (3). Don’t get too excited – because we are not talking about the sweetened milk chocolate (sorry!). We are referring to cacao-rich dark chocolate. Chocolate triggers the release of endorphins and interacts with the neurotransmitters dopamine and serotonin. These systems control your hunger, mood, and stress (5). 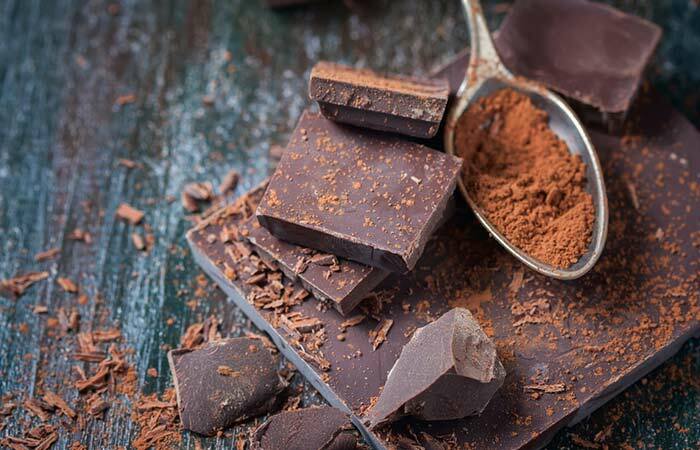 Dark chocolate also contains theobromine – a compound that has a mild stimulatory effect on your brain (5). Anandamide is another lipid found in chocolate that gives you a ‘happy-high’ feeling. This compound stimulates the production of dopamine that promotes the feeling of well-being (6). Surprisingly, chocolate also contains two other chemicals that delay the breakdown of anandamide in the brain, thus prolonging the feeling of well-being and happiness it creates (6). This is exactly what depressed individuals need (in moderation, of course)! Onions are rich in dietary flavonoids that have proven antidepressant effects (7). They also contain quercetin, which is a potent antioxidant. This flavonol increases the availability of neurotransmitters like 5-hydroxytryptamine and norepinephrine. During depression, the levels of these neurotransmitters are abnormal. 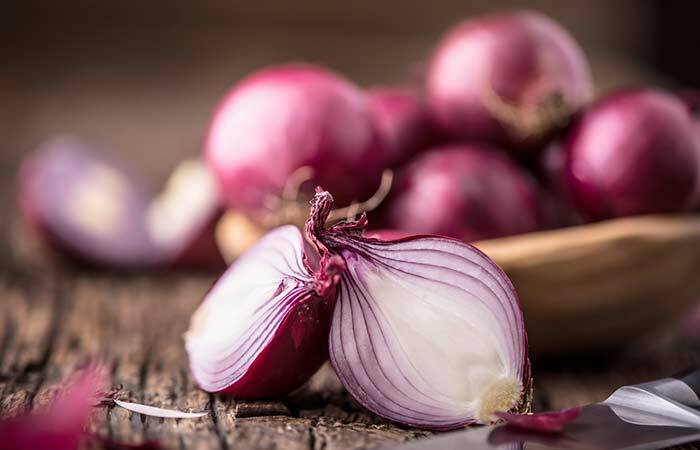 Onion flavonoids help in lowering depression by regulating these neurotransmitter levels, energy metabolism parameters, and cytokine levels and reducing oxidative stress (7). 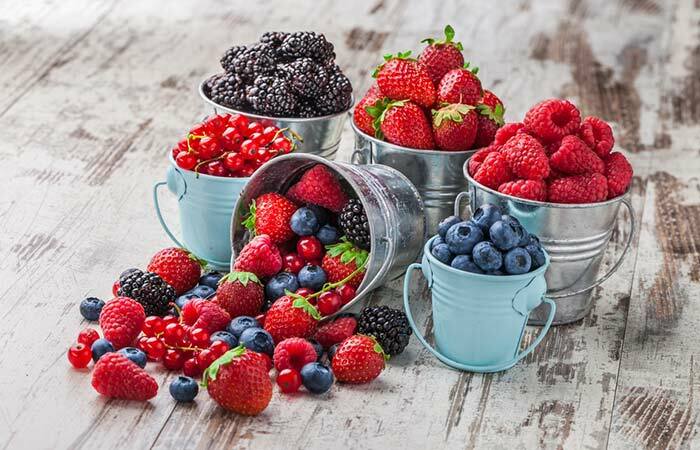 Blueberries, raspberries, goji berries, strawberries, and other members of the berry family contain potent antioxidant and anti-inflammatory agents. They all contain varying amounts of polyphenols like anthocyanins, proanthocyanins, flavones, flavonoids, and catechins (8). Apart from chlorogenic acid, one of the most abundant polyphenols that berries (mainly, blueberries) contain is resveratrol. This natural compound has been found to have antioxidant, anti-inflammatory, and antidepressant effects in experimental models using animals (9). This could be because resveratrol may alter the inflammatory process of brain centers involved in mood regulation (like hippocampus) (10). The antioxidant effect of resveratrol can also prevent the cognitive decline associated with age-related depression (10). 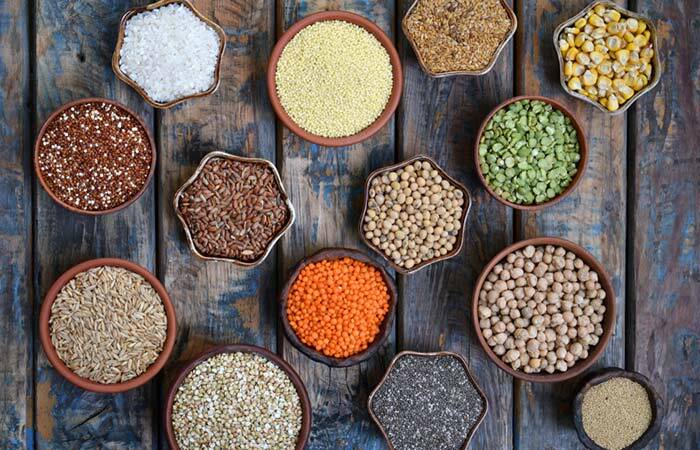 Whole grains are great sources of micronutrients. Out of all the minerals they offer, zinc, selenium, and magnesium have the highest impact on your brain and its activity centers (11). Zinc, for example, can help lower the amount of cortisol (the major stress hormone) in your blood, increase the expression of certain factors like the brain-derived neurotrophic factor (BDNF), which is important for nerve health, and prevent damage from free radicals (11). Magnesium and selenium take care of the serotonin, dopamine, and norepinephrine equilibrium, boost hippocampal activity, and curb inflammation that could be driving the severity of depression (11). Certain bean, legume, and seed varieties also have an antidepressant effect. Their high isoflavone content (in the case of soybean) and dopaminergic action (in velvet beans) can help you fight depression (12), (13). Low serum calcium and vitamin D levels are also associated with depression and anxiety. Low-fat, fortified dairy products are a good source of these nutrients. This can reduce age-related depression and musculoskeletal pains too (14)! The active compound in turmeric is curcumin. Several studies have demonstrated the antidepressant effects of curcumin. It primarily functions as a monoamine oxidase (MAO-A and MAO-B types) inhibitor (15). Monoamine oxidase is responsible for the degradation of norepinephrine, serotonin, and dopamine – neurotransmitters that regulate your mood. Therefore, inhibiting this enzyme increases the availability of these neurotransmitters. In other words, curcumin prolongs the action of norepinephrine, serotonin, and dopamine, thus creating an antidepressant effect (15). Another potential reason for curcumin’s antidepressant effect is its small molecular size. 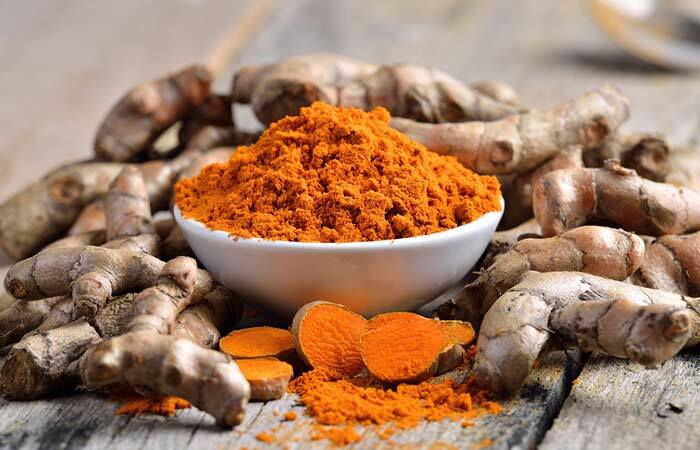 Since it is small and chemically polar, curcumin easily penetrates the blood-brain barrier and acts on the prime action centers in the brain, promoting neurogenesis in the hippocampus. An active hippocampus is inversely linked to depression (15). Avocado is rich in magnesium an important mineral for your brain. It helps in the timely release of neurotransmitters, regulates thirst, hunger, mood, sexual drive, and sleep cycle, and reduces anxiety and depression (16). Avocado is also a rich source of folate. This is important to note because low levels of folate have the potential to increase the risk of depression (17). 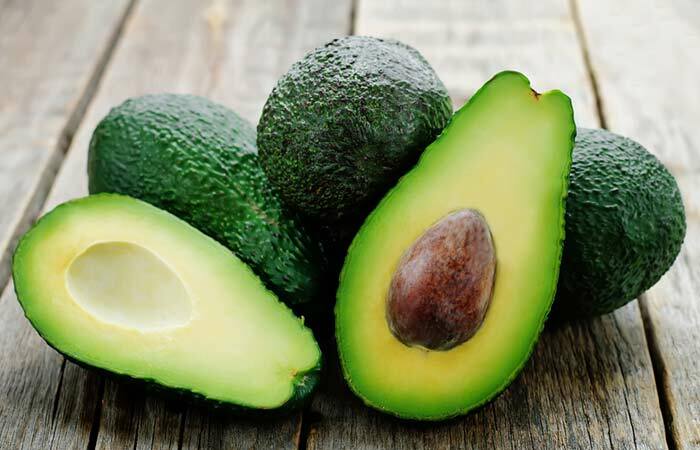 The B vitamins found in avocado trigger the release of the “feel good” neurotransmitters such as dopamine and serotonin. This can help you manage the symptoms of anxiety (18). If you are going through the lowest phase of your life, don’t worry – you are NOT alone. Seek professional help and talk to your family and friends. In addition to medication, you can also include these foods in your diet to manage the symptoms of depression. Let us know in the comments section below how helpful these foods were. You can also leave your questions about this topic, and we’ll get back to you.